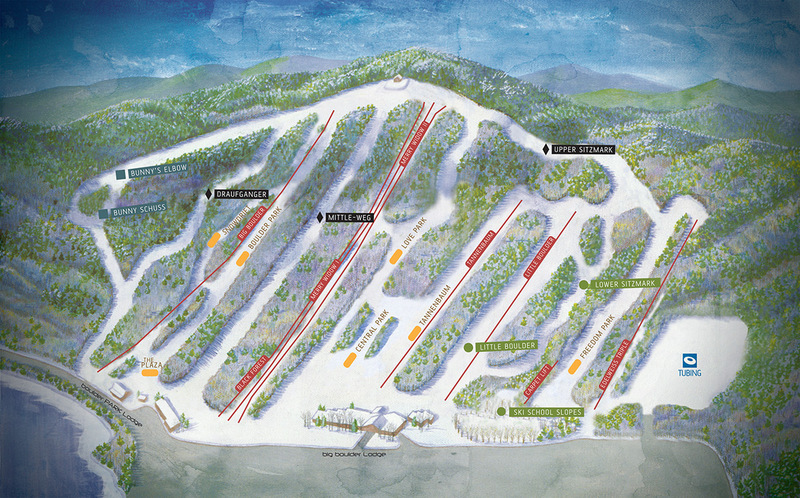 There’s no doubt about it, Big Boulder Ski Area is the place for park skiing in Pennsylvania. Fully 50% of its terrain is dedicated to freestyle skiing and boarding. And if that’s not your thing, at least not for the whole day, you can head over to nearby sister slope, Jack Frost Ski Mountain for more skiing and riding on the same ticket. Despite having just 500 foot vertical drop (from a summit of 2,100 feet), Big Boulder PA feels like a well-sized Poconos ski resort. It’s heart lays in the series of parks through the center of the mountain: Snowdrift, Big Boulder Park, The PLAZA, LOVE Park (named after Philadelphia’s popular skateboard destination), Central Park, Tennenbaum, and Freedom Park. These range in ability, with Freedom Park the least challenging and Boulder and LOVE the most extreme. Non-freestylers can find some long green slopes around Freestyle Park and some intermediate runs beyond Boulder Park. With Draufganger and Mittle-Weg, there are still a couple non-park expert slopes on Big Boulder Ski Resort. 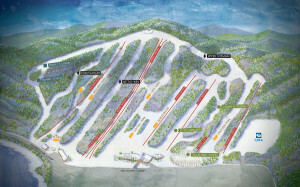 Eight ski lifts serve the 15 runs across 55 acres. Big Boulder Pa trail map. Clickenzee to embiggen. Big Boulder Ski Resort started out as a ski club for local mine workers and split from nearby Split Rock Lodge in the 1940s, making it the oldest extant commercial ski resort in Pennsylvania. (Read an extensive history of Big Boulder PA here). The owners created Jack Frost Mountain in 1972. With the onset of snowboarding and freestyle skiing, Big Boulder PA became the de facto snowboarding hill while Jack Frost was the skiing hill. Riders and skiers may find something to appeal at both. Both Jack Frost and Big Boulder offer a tubing park, but unlike Jack Frost, Big Boulder Ski Resort has night skiing. Staying in a nearby condo and skiing nights at Big Boulder and days at Jack Frost can provide a great and easily accessible ski weekend.